I’m currently in an amateur production of Goodnight Mr Tom The Musical. The story isn’t new to me – I’ve seen the film a few times. However, what has struck me most by revisiting this story, is the way Tom handles the trauma that William goes through. For those who don’t know the story, there is a scene towards the end where William is in hospital after his traumatic imprisonment. A psychiatrist is talking to Tom about what is best for the boy in terms of treatment. Tom wants to take him home but the psychiatrist believes the boy’s best interests would be served by putting him in a children’s home and subjecting him to psychiatric analysis – something that was probably cutting edge back in 1940. William is quite rightly frightened of the medical profession who have sedated him every time he cries out, since he has arrived in the hospital. This was done so he doesn’t disturb the other patients. Tom challenges the psychiatrist on this, and suggests that “mebbe he needs to” cry out. He also says that it’s obvious as to what’s wrong with the boy – “the boy ent had a lot of lovin'”. This raises an important point in any therapy situation. The need to allow the emotions to come out and the need of everyone to have love and acceptance in their lives. Both are vital to healing. When we suppress our emotions, our energy starts to block up. Emotions are fluid when they are in their healthy state, so by blocking them up, we cause them to fester until, eventually, they develop into physical illness. This is when they do the most damage. We need to release them, maybe by crying, maybe by screaming. Sometimes we release them just by acknowledging them. The second point, love, is one of the most important things we need in order to flourish as human beings. With love, comes acceptance and acceptance allows us to work through our emotions, knowing that it is safe to do so. When we are left to process unpleasant events naturally, we can go through a roller-coaster of emotions. The boy, William, has nightmares for quite a while, which he wakes from screaming. The difference is that being at Tom’s house, he’s given love when he wakes rather than a sedative. Eventually things heal. The body and mind are designed to heal unless there is something in the way preventing it. Maybe they would have still healed in the children’s home, but the process may have taken longer and may have produced other traumas. Interestingly Tom probably gets his insight into healing from his own experiences. His character is widowed in his 20s and has isolated himself away from his community ever since. He’s been able to cry out when he needed, but he lacked love until the boy is dropped off onto his doorstep by the billeting officer. Until that point he’s become a bitter, grumpy old man. It’s the love that develops between him and William that really heals him and bring him back to happiness. Thankfully most modern therapy isn’t anywhere near as harsh as they treatment back in 1940. However this shows that the simplest things like love and acceptance are often the most powerful and they are available for any of us to give. Goodnight Mr Tom The Musical is being performed at the John O’Gaunt School, Hungerford from Wednesday 17th to Saturday 20th Feburary 2016, including a Saturday matinee. Tickets can be purchased here. 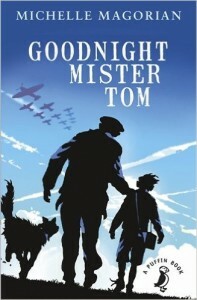 Goodnight Mister Tom (A Puffin Book) by Michelle Magorian can be purchased through Amazon here.